“A Personal Transformation with Dr. Joe Vitale. The number one thing stopping you from attracting what you want are the “counter intentions” in your unconscious mind. Click Here to Get VIP Clearing Event Access for $390 per YEAR! Two months FREE! Everyone has them. Subconscious beliefs that stand in the way of getting the life your deserve. Start clearing them away now! Delete, Replace, Reprogram the current routines running in you right now. Your mind can be changed just like your body. When you feed it, work it out, and maintain it, you can actually change your mind! The Clearing Event calls serve as a wonderful, calming meditation. Soothing your mind and allowing you to recharge your energy. When the mind is cluttered, clarity is difficult; your manifesting energies are clouded. Blow out the clutter and allow your best life to become real. Reserve your spot for the MONTHLY Clearing Event Sessions! This is the ONLY way to get on these calls. Hi, Dr. Joe Vitale here. Welcome to the website called TheClearingEvent.com. There are three reasons why you want to be on these calls every month, and the very first one is you get to clear the beliefs that are in the way of you having what you want. If you know about the Law of Attraction, you've read my books, you saw the movie The Secret, but you still struggle with what you want, it's because of beliefs. Change your beliefs, you get a different reality. I want to help you change your beliefs, and I want to do it for you on these clearing calls. That's the first reason. The second reason to be on these calls is because I want to remove the blocks that are in your unconscious mind, your subconscious mind. You may not even know what those blocks are, but if I remove those and we do it together, you will be free to go right down the path, no blocks to getting what you want. That's the second reason to be on this call. The third reason to be on these clearing calls is because you achieve a calm mind. A calm mind, a calm body, a calm life. Those are three reasons...there's more. You have limiting beliefs right now. These are the unseen limiting beliefs operating because of past programming. 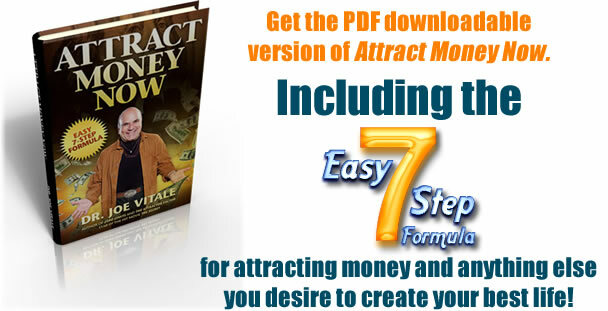 Until you clear them, it will be difficult to attract love, romance, money, success, health or much else. 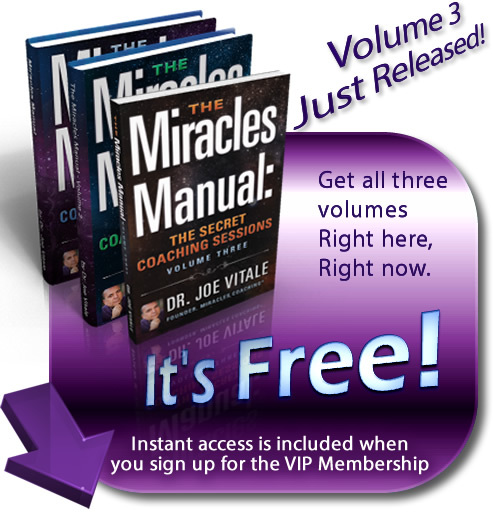 Here’s your chance to clear them with the help of Secret movie star, bestselling author, founder of Miracles Coaching®, Dr. Joe Vitale himself! He will personally do energy work and more to clear you of your blocks. You don’t need to know the blocks to clear them; you just need to know what you want. Where: From the comfort of your own home or place of your choosing. How long: 45 – 60 minutes. What will happen: Dr. Vitale will lead the group through a mass cleansing, using ho’oponopono, The Secret Prayer, Nevillizing, Socratic questioning and more! Your obligation: None, other than to listen to the recordings and be willing to relax and have faith. To prepare: Think of what you want to have, do, or be. If you haven’t read The Attractor Factor, Zero Limits, or At Zero, you might want to before the call, but it is not a requirement. What folks are saying about The Clearing Event. People ask me every day, 'How do you stay so clear healing and clearing so many people every week?' My answer is, I relax and let Dr. Joe Vitale clear it away on his once a month clearing event phone call. It is the one gift that I give myself every single month without fail. open to the flow. This is the way that I knew. I decided to do Joe’s clearings every single night. while I concentrated on the clearings and being clear. I wholeheartedly love your clearings Joe, thank you!! The effects really are like little miracles. I must say, I loved the cleaning. I read zero limits in Aug. and started doing the meditation and I love you, I am sorry, please forgive me, thank you morning noon and night. went on Utube and found meditation. did these daily. Starting purchasing different programs all have to do with zero limits. Jan 17...4 times the amount from last year!!! I am so excited about my success. Decide for yourself how powerful this is, and imagine what life is going to be like when you wake up clear, excited about life, and moving forward to having whatever it is you want, and have the mindset that I have right here. Expect miracles. You deserve it. Plus a few other Very Special Gifts all when you become a VIP Clearing Event Series Member. WARNING: We only have 1000 spots on our conferencing system available and space will fill up fast so register now to avoid missing out. These Clearing Events are packed and will fill up fast! 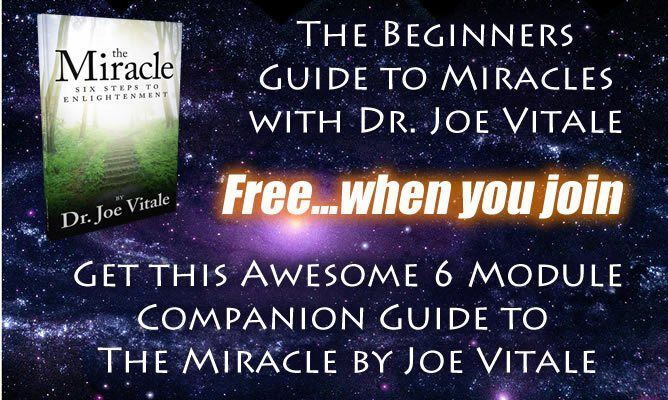 OR you can take advantage of this special offer...Get TWO months FREE when you sign up for an entire year with Dr. Joe Vitale....Claim your spot below! Click Here to Get VIP Clearing Event Access for $390 per YEAR!That's 2 months FREE. Sign up in 60 seconds.